DALLAS — March 1, 2010 — Pizza Patrón celebrated the opening of its 7thlocation in San Antonio, TX on February 1st. The restaurant is located at 4638 W. Commerce, San Antonio, TX 78237, on the corner of W. Commerce St and General McMullen Dr. The new restaurant is a combo dine-in store with full service drive-thru window and immediately jumped into the top 10 in sales and has consistently battled for #1 spot, setting a sales record within weeks of opening. The new dine-in restaurant is the second to feature Pizza Patrón’s new Latin design mural wall which includes a vivid color palette and unique Spanish phrases which resonate with Pizza Patrón’s customers. The store is open from 11 a.m. to 10 p.m. Sunday through Thursday, and 11 a.m. to midnight Fridays and Saturdays. Call-in orders can be placed by dialing (210)-434-2800. The new store will feature the brand’s famous everyday values like the 12-inch medium AMIGO PIZZAS® that start as low as $4 and X-Large LISTA-NOW READY™ pepperoni pizzas starting as low as $6 all day, every day. The lease for the building was negotiated by Marsha Schneider of RTS Real Estate Services. For more information, call (972) 698-7900. Approximately 93 percent of Pizza Patrón restaurants in the U.S. are owned and operated by franchisees. 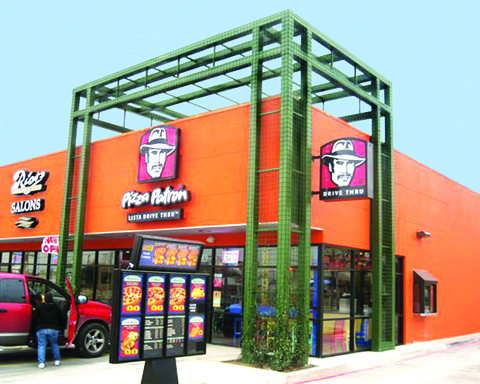 Pizza Patrón plans to have 750 stores nationwide within a decade. Pizza Patrón, America’s #1 Latin pizza brand, offers traditional pizza, wings and sides in its community based, Latin-influenced stores. Pizza Patrón was founded by restaurateur Antonio Swad in 1986, in Dallas, Texas, and today operates 96 dine-in and carry-out restaurants in seven states with 40 more under development. Pizza Patrón has franchise opportunities available in prime markets throughout the country offering a proven system for hard-working franchisee candidates. In 2007, the brand received international news coverage when it decided to accept Mexican Pesos at all of its locations, gaining over 500,000,000 media impressions worth over $30 million in the U.S. alone. The company’s medium AMIGO PIZZAS® start as low as $4 and X-Large LISTA-NOW READY™ pepperoni pizzas start as low as $6 all day, every day.